Do you love the look of lighted tree trunks in your holiday decorating, but hate the hassle of wrapping them? 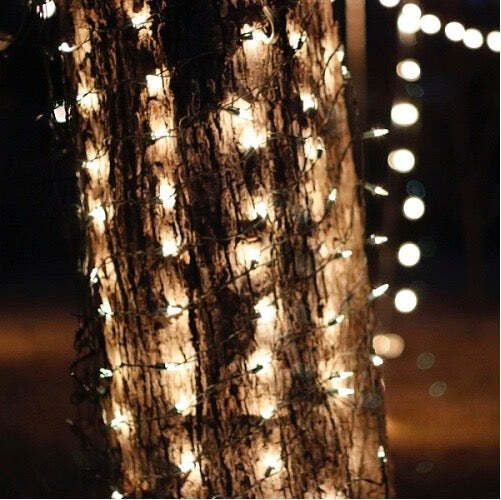 Tree trunk net lights should be added to your shopping cart! Each set of these net lights is 2 feet wide by 6 feet high and ideal for wrapping small trees. Your outdoor Christmas light landscape will become a winter wonderland with these easy to install trunk wraps. Net spacing takes the guesswork out of making sure your lights are lined up and evenly positioned. Three sets are the maximum to use in a series before adding a second extension cord. Consider also using these net light sets for covering stair railings or porch columns. Trunk wrap lights are a great choice for restaurants or malls that want to make a statement and create a festive look to their outdoor venues. They are approved for both indoor and outdoor use. Q: If one of the bulbs go out do all the bulbs go out? A: If a bulb burns out, then yes, the rest of the lights would stay on. If a bulb is unseated or removed then all the other bulbs in that section of the light string will go out. Hope that helps. Please let me know if you have any other questions.